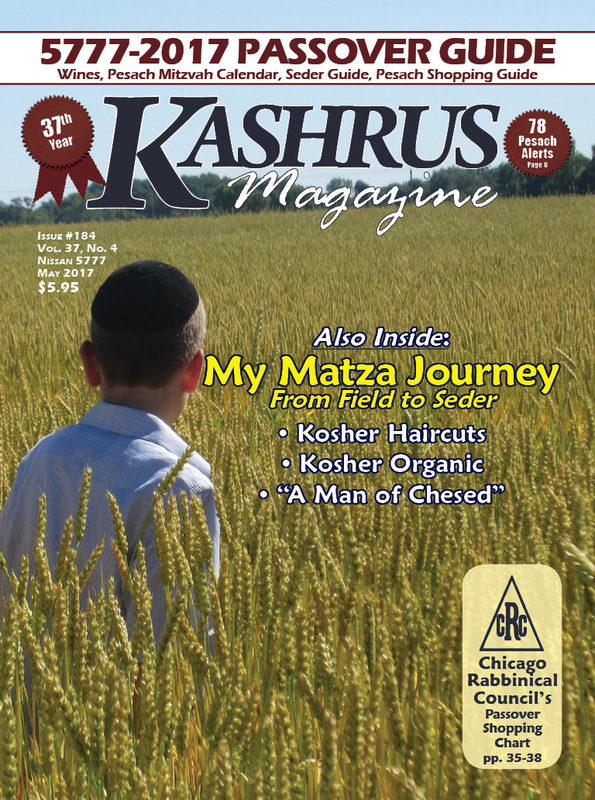 Plus: My Matza Journey, Kosher Haircuts, Kosher Organic, "A Man of Chesed"
If you’ve visited a matza bakery, you’ve stood in a noisy room filled with hustling people and stern-faced supervisors overseeing fast-paced action, energetic kneading, flying dough and smoking matzos being tossed from the oven. While the experience may have been religiously inspiring and educating, the uninitiated visitor likely missed much of the nuanced procedures taking place there. Watching the goings-on’s in a matzo bakery is like observing a master painter; we see the beauty of the finished product but don’t really understand how it came to be. I wanted to understand matzos from the inside out and I knew that a tourist-like visit to a bakery would not do it. To get the complete experience I felt I would have to start from the beginning and work my way through, participating in every step of the production from the wheat field through packaging. The later stages that take place in local matza bakeries were easy to observe. I was easily able to join groups baking matzos in a bakery and I even made (a successful) attempt at baking erev Pesach matzos in my own kitchen. What I needed to learn was what happens ‘out in the field’ until the flour reaches the bakery. So, in the late spring of 2015, I joined a group who traveled to Western Jersey to cut wheat for matza. Months before we arrived, a coordinator had arranged with several farmers to allow us to harvest their yet-green wheat. Ideally, matzos should be made from wheat that has not had any contact with water after the grain has matured. In halachic parlance, immature wheat is called ‘green wheat’ because, in the early stages of growth, the chaff coating the wheat berries is grass-green. At that stage it is still growing—‘requiring the attachment to the ground’—and not subject to become leavened if it comes in contact with water. Once the wheat dries and the chaff darkens it can become chometz if it gets wet from rain or irrigation. There is an ongoing contemporary debate about where to draw the line between green and dry wheat. The group that I was with was composed of ‘conservatives,’ who cut their wheat at a very early stage. Our coordinator monitored the weather for several weeks before the harvest. If we cut early, the berries could not become chometz, but would be undersized and produce a small quantity of poor quality flour. If we waited too long, the grain may mature and get ruined in an unexpected downpour. An early rain would also mean larger berries and more flour for less work. Dry weather would mean quicker maturity. Weather that was dry and then wet would result in unusable mature grain, because of the possibility that the grain had matured before the rain and had become chometz. So, our coordinator paid very close attention to the weather. We were kept abreast about developments in the field by postings on a call-in hotline. One day in early June, the announcement came that conditions were right and that it was time to head to Western Jersey for the harvest. To read the rest of this article, subscribe or buy a copy of this issue. It is now two years that we have kosher-certified marijuana which is limited to medicinal use. However, 7 states have recently legalized recreational marijuana. So far, no state has permitted marijuana to children. Unfortunately, some are trying to capitalize on the Jewish market and are making kosher claims without having kosher certification. Instead, they make statements of self-certification, which are rarely challenged by their eager customers. What follows is an accurate look at this new challenge to our community. We have removed direct references to names of products, people, and locations. At a summer festival, attended largely by observant Jews, a 20-something yeshiva boy was handing out cholent. The cholent was made using cannabis oil. Unlike those in New York, where a highly restrictive medical program encourages a robust black market, Californians have legal access to a handful of brands and dispensaries offering “kosher” marijuana products. Los Angeles alone has a number of kosher options. A collective on Melrose offers kosher gummy bears, brownies, chocolate, hard candy, and even beef jerky. The collective's owner makes all the edibles herself and ensures that “the kitchen is kosher, as well as the ingredients.” “Religious people trust us,” she says, adding that ,“they know I control the ingredients.” Another brand is grown on a “shomer Shabbos farm” — meaning that nobody on the farm does any work on Shabbos or on yom tov. He also claims that everyone involved in the growing of the crop, the manufacturing and the packaging of the edible marijuana is shomer Shabbos. Thus far, the demand for kosher edibles is quite limited. Some are prepared in a collective's kosher kitchen to provide for Californians, while larger brands claim to be incidentally “kosher-compliant,” but do not intentionally target a Jewish clientele. It’s not that you can’t be kosher for Passover wherever you are, but, in New Jersey, you know that someone is watching the food businesses with you in mind. Okay, New York, and some other states, also have hardworking people to help protect the kosher consumer, but, for decades, New Jersey has earned an excellent reputation at issuing fines. Most of the work of the dedicated kosher inspectors in New York and New Jersey is kept “under wraps,” but we were able to glean this information about how New Jersey handled Passover 2016. Hopefully, they will continue their efforts this year as well. Last year the New Jersey Division of Consumer Affairs inspected 546 supermarkets, delis, and other businesses purporting to sell kosher foods to ensure that the stores are meeting their claims when selling foods that they represent as kosher. This was an increase by 100 inspections over the year before. As a result of those visits, 10 establishments were cited and assessed civil penalties totaling $12,000 for alleged violations ranging from mislabeling food items to failure to keep proper records or display proper signage. That number is tiny compared to the numbers that Rabbi Mendy Dombroff used to bring in to New Jersey’s coffers with fines starting at $10,000. That was back in the days when the New Jersey kosher law had teeth in it. Rabbi Shulem Rubin, head of New York State’s Kosher Law Enforcement Bureau, a division of the New York State Department of Agriculture and markets, used to bring in hundreds of thousands of dollars in fines every year. Still, the 546 visitations plus the fines will act as a mini deterrent. The first of the big three states with kosher laws to bite the dust was New Jersey, in 1992. It was the first to suffer defeat in lawsuits by disgruntled companies which were fined for their kosher violations. The word Orthodox in the kosher code for New Jersey was shot down and the kosher law deemed unconstitutional. Baltimore suffered defeat in 1993 in Federal Court. And by the year 2000, New York’s 100 year old kosher law was defeated by a lawsuit from disgruntled butchers who received several fines for kosher infractions despite their having been certified kosher by a Conservative rabbi. The posters must disclose specific information, such as whether the food was approved by a kosher certifying organization, or by an individual rabbi, or not supervised at all (self-certification). If under supervision, a store must disclose the name of their rabbinic certifier or certifying agency, how often the kosher supervisor inspects the store, and whether or not the kosher supervisor requires all ingredients to be kosher-supervised. New Jersey’s Kosher Food Protection Law and Kosher Food Regulations protect the kosher-buying public by requiring kosher food sellers to disclose important information to the public, as set forth below. Packaged foods may only bear a kosher symbol (such as the “OU” used by the Orthodox Union) with prior written authorization from the person or agency represented by that symbol. This is what we call re-packaging. Supermarkets and other businesses that sell such foods in sealed containers may rely on the manufacturer’s or distributor’s representation that the proper approval was obtained. Establishments that prepare foods must disclose whether they use separate utensils for meat, dairy, and pareve items; and whether they keep separate working areas for the preparation of meat, dairy, and pareve items. Establishments that represent themselves as being “under kosher supervision” must disclose upon request any items which are not under supervision. Consumers who believe they have been cheated or scammed by a business, or suspect any other form of consumer abuse, can file an online complaint with the State Division of Consumer Affairs by visiting its website http://www.njconsumeraffairs.gov/ or by calling 1-800-242-5846 (toll-free within New Jersey) or 973-504- 6200. Similar practices are going on in New York State too. Rabbi Aaron Metzger is the Director of the New York State Department of Agriculture and Markets, Division of Kosher Law Enforcement. He, too, is active on our behalf, and has fined companies for misleading the public, but his fines are not publicized. His office can be reached at 718-722-2852, kosher@agmkt.state.ny.us.